The deposition of optical interference coatings requires precise control of layer thicknesses and refractive indices in order to yield predictable, reliable performance. One of the challenges in the use of evaporated coatings is the porous ﬁlm structure and the associated sensitivity to relative humidity and temperature which results from the low energy of the deposited molecules [1,2]. The use of an End-Hall ion source can provide added energy at the surface of the condensing ﬁlm, resulting in a denser ﬁlm structure for the coating molecules . This denser structure can reduce or eliminate the penetration of water into the ﬁlm, thereby limiting the change in refractive index and other optical parameters in the coating. This densiﬁ cation also provides a harder, more mechanically-durable ﬁlm, even at low deposition temperatures . A typical system for optical interference coating deposition consists of a 0.5 – 1.5m vacuum chamber with planetary or single substrate rotation and one or more evaporation sources, as shown in Fig. 1. The system geometry should be arranged to provide nearly equal coating thickness on all substrates, or masks should be introduced to partially shadow regions of higher vapor ﬂ ux . The addition of an End-Hall ion source should be conﬁgured such that nearly-equal ion ﬂux is provided to the entire substrate surface area in the coating chamber, while maximizing the utilization of the available ion ﬂux. The modeling of ion ﬂux with a cosine-power distribution is discussed in KRI Technical Report TR-01. The placement of the source in the chamber and the tilt of the source from vertical provide the necessary adjustments to evenly distribute ion ﬂ ux. The determination of ion ﬂux uniformity requires the modeling of the substrate movement, source placement and pointing using a cosine-power distribution for the ion source ﬂux and rotation motion for the substrate . An approximate starting point is to place the source directly beneath the center of the planet and direct the source at the inner edge of the annulus described by the planet motion (see Fig.1). though the use of slightly higher ion energies (up to 150eV) may be required to achieve the desired degree of densiﬁcation . Development of ion-assisted deposition requires knowledge of the process variables, and the inﬂuence of each on the resulting ﬁlm properties. These include the ion energy, current, gases to be used, gas ﬂow rates, and the ﬁlm deposition rate. The discharge voltage determines the ion energy (eV), by establishing the potential difference through which the ions are accelerated. On an End-Hall ion source the ion energy corresponds to approximately 60% of the discharge voltage. High discharge voltages provide greater ion energies, but can increase optical absorption and defect densities. The lowest possible discharge voltage should be utilized that achieves the desired ﬁ lm densiﬁcation, usually less than about 150V. Fig.3- Inﬂuence of humidity on a 9-layer hafnia/silica mirror deposited at ambient temperature with ion-assist provided by the KRI eH3000. Once again, the difference between the ﬁlm transmittance in ambient and dry envirnments cannot be resolved (fully dense). for production throughput, while minimum rates are desired for greater densiﬁcation. A suitable ion-assist process should be established with production deposition rates, reducing the rates as needed to achieve sufﬁ cient densiﬁcation. These concepts were utilized to establish a process for ion-assisted deposition of hafnia/silica multilayer coatings in a 45-inch coating chamber with planetary rotation. Hafnia in particular requires a high ion dose for densiﬁ cation, more than triple that required for other commonly-used oxides such as titania, tantala, and silica . Hafnium metal and silica granules were used as the source materials in dual electron-beam sources. A KRI eH3000 with a hollow-cathode neutralizer was installed 11” from chamber center, pointing 15º from vertical toward the chamber center. The source was operated with a 150V/20A discharge using a 85/15 O2/Ar gas mixture for improved densiﬁ cation. The coating process was established with no additional substrate heating, to allow processing of thermally-sensitive substrates as well as providing faster cycle times. Fig.2- Inﬂuence of humidity on a densiﬁed hafnia layer. Note that the difference between the ﬁ lm transmittance in ambient and dry environments cannot be resolved, indicating minimal diffusion of water in the ﬁlm. 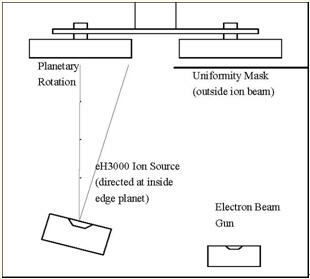 require an ion beam current up to 5A. Ion sources typically utilize non-reactive gases such as argon, though the deposition of oxides, particularly refractory oxides such as hafnia, tantala, titania, etc., require the addition of oxygen during the deposition. The effective high-vacuum pumping speed must be sufﬁcient to maintain the chamber pressure in the 10-4 Torr range or lower, while gases are introduced at the established process ﬂow rates. Maintaining such a process pressure optimizes operation of the End-Hall ion source and avoids energy loss for the beam ions due to molecular collisions. Gas selection may also be used to modify the ﬁ lm densiﬁcation. For instance, the addition of a small amount (10-20%) of Ar to the O2 gas in an End-Hall source can provide signiﬁcant improvements in densiﬁ cation, since the mass of Ar is 25% greater than that of an O2 molecule. If still greater ion momentum is required, the use of Kr or Xe gases provides a substantial increase in momentum, while still using an inert gas. with a 20A discharge to provide maximum densiﬁcation, but the use of 100% O2 through the source resulted in ﬁlms exhibiting spectral shift given the ambient deposition temperature and large coating system. By modifying the gas ﬂow to include 15% Ar / 85% O2, full densiﬁcation of hafnia was achieved at 150V without intentional substrate heating. Spectral measurements of a hafnia single-layer coating at 40% RH and N2-purged 0% RH are shown in Fig. 2. Spectral shift is essentially eliminated through the use of the high-current eH3000, while enabling the coating to pass severe abrasion testing per MIL-C-675. Silica can be expected to densify at lower ion source power, so ion source output may be reduced. However, it is often easier to maintain the source at constant output for all layers, provided sufﬁ cient densiﬁcation is achieved. Fabrication and testing of a 9-layer multilayer high-reﬂector coating was performed under identical process conditions. The use of an abbreviated high-reﬂector coating was utilized, since it exhibits greater sensitivity to humidity shift. The results are shown in Fig. 3. The measurements of both the single hafnia layer and the hafnia/silica multilayer exhibit no spectral shift as the ambient humidity of the surrounding environment is varied. This indicates an absence of porosity in the ﬁ lm, conﬁrming sufﬁ cient ion ﬂux was present to fully-densify both the hafnia and silica layers without the use of substrate heating. It should be noted that operation of the ion source will lead to some heating of the substrate surface, and process development must be matched to the length of deposition and the relative thermal sensitivity of the substrate material. The use of an End-Hall ion source provides high current output sufﬁcient to fully densify hafniasilica multilayer coatings in a production-scale electron-beam deposition system. As larger area coatings are deposited in production deposition systems, the required beam current increases, necessitating the use of larger ion sources such as the KRI eH3000. Additionally, should the use of 100% O2 through the ion source prove insufﬁcient for the degree of densiﬁcation required, the use of a low fraction of a more massive gas such as Ar, Kr, or Xe may be incorporated to provide full densiﬁcation at low beam voltage. Careful determination of source location and pointing can lead to uniform ion ﬂux distribution over large substrate areas, making the integration of an End-Hall source in a production process highly effective, even for large optics. J.B. Oliver et al, “Optimization of laserdamage resistance of evaporated hafnia at 351nm,” Proc. SPIE 7132 (2008). J.B. Oliver et al, “High precision coating technology for large aperture NIF optics,” in Optical Interference Coatings, OSA Tech. Digest, p. ThD2, OSA, Washington D.C. (2001). J.B. Oliver and D. Talbot, “Optimization of deposition uniformity for large-aperture National Ignition Facility substrates in a planetary rotation system,” Appl. Opt. 45, 3097-3105 (2006). H. Kaufman and J. Harper, “Development and Applications of Ion Sources,” Proc. of SVC (2007). A. Anders, “Plasma and Ion Assistance in Physical Vapor Deposition: A Historical Perspective,” Lawrence Berkeley Nat. Lab. (2007).